Everything started from a small catchword of A.Sklyarov in a documentary movie about South American pyramids. He expressed the suggestion that nobody cut-off horizontally mountain tops in the plateau Naska in Peru. I was touched by this remark. 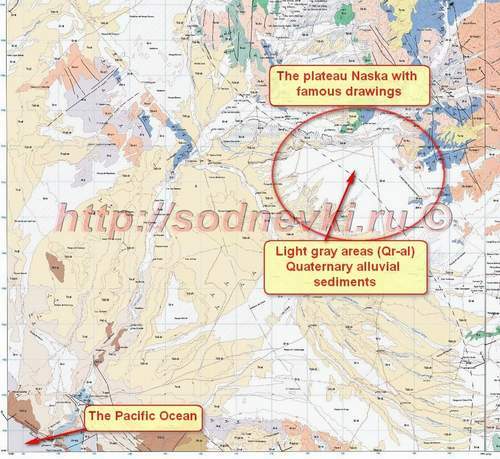 Recently with the help of my colleague from Peru I got the geological map of the Naska desert area. What could we see on it? There are signs of Qr-Al all over the areas where Quarternary alluvial sediments occure. The places were corresponding to all areas where famous Naska pictures were found. I suppose that the plateau Naska geomorphologically represents a huge mudflow evacuation cone. If you look at google maps of that area and correlate them with a geological map, everyone could see correspondence between Qr-Al sedimentary surfaces and those with ancient pictures. Thus, it is not a mountain plateau and nobody cut-off horizontally mountain cliffs with so called gigantic lasers. Something huge exploded in the Pacific Ocean, close to the Western shore of South America and raised a tremendous tsunami. A colossal wave with the oceanic floor material (sand + mud + debris) rushed toward the shore of South America. The plateau Naska is located about 60-65 km from the Pacific Ocean. Everything what was carried by this wave smashed against the surface and rolled towards mountains, bearing and covering everything with mud, sand, and debris. The lightest part of this wave reached Cordillera mountains and even overtopped them and flooded mountain valleys (from this point we can assume the answer why water in the Lake Titicaca is saline and has flora and fauna from the sea) forming huge saline lakes. This model could describe why some heavy stone blocks in Machu-Piсchu were thrown down like domino knuckles from the top of the ancient fortress. Eventually a significant part of this wave returned back to the Ocean, the agitated material at the bottom of it worked as a gigantic abrasive instrument destroying and grinding original landscape of former paradise, turning this area into deserted plateau. Probably nice urban area was situated here prior this catastrophic event, something similar to Silicon Valley and Los Angeles in the United States. All this beauty was destroyed instantly and burred below this thick layer of sediments. Later on during the Quaternary period of geological history, those sediments were channeled by canyons, and many researches mistakenly speculate about leveling this area with humongous lasers. Ancient civilization could not recover easily after this catastrophe, and later degraded descendants decided to mark places of the buried locations of cultural centers with different symbolic pictures. As we all know nobody dug deeper there yet. In any cases according to the history of humankind those events took place not a long time ago, maybe 10-12 thousands years ago. Of course, it is a different story about the age of those buried cities. But we know for sure we need to dig there! At this moment we can’t afford archaeological investigations there, but nobody could restrict us to investigate seacoast of Peru using different maps and photographs from the Internet.